Today is the 6th April 2010, and this morning at around 11:45, the date for the election was finally officially announced. This morning, Her Majesty was flown by helicopter to Buckingham Palace, and Gordon Brown made his way to the Queen to request for Parliament to be dissolved. 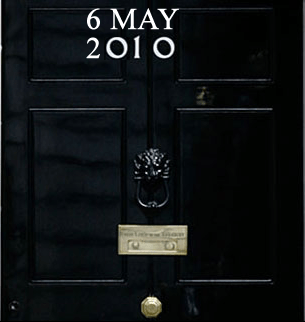 Then, he made his way back to Downing Street, and finally ended months of speculation as to the official date of the election – 6 May 2010. …but then spent the next half hour back inside Number 10, probably saying ‘goodbye’ to the people inside – many of whom fear it could be their last day. Then finally, he left in a limousine with Sarah Brown (his wife). Those watching live across the BBC (on TV and online) were then shown fifteen minutes of poor Huw Edwards having to narrate a tracking shot of the BBC’s live helicopter, hovering over the car like a bird-of-prey as it travelled across London. There was one funny moment though, as the helicopter caught a Tory poster with the words ‘Vote For Change’ on Brown’s route. It did leave me wondering (as he drove down Bus Lanes, dodged traffic, and drove the wrong way down London’s busy roads) does he pay the Congestion Charge? As he made his way to one of his lovely trains when he reached St Pancras, there were scores of people (some of whom were possibly convincers) who walked with him. Portraying the image of the lovely family man, he shook hands with kids who will now be scarred for the rest of their lives, and spent two minutes with some joker who wanted a Facebook picture of him and Gordon, though his camera kept breaking. This election is the first to involve the internet and the TV in this way. For the first time, services like Twitter and Facebook are being used to advertise the parties. And with the first ever TV debates going out on ITV, Sky, and the Beeb, it will be interesting to see if this new novel way of propagandising will make a difference. And it’s the first election since the Expenses Scandal of last year. Will that have any form of effect?